A very inspiring and special man. In this experiment I make copper sulfate crystals. For the sake of the beauty of the crystals and the beautiful blue color they have. Also I like the energy very much. As many alchemist know these days there are several paths that claimed to be leading to the Philosopher’s Stone. Like the Dew Path, Acetate Path, Vitriol Path etc, etc. One of them is also the ‘Cinnabar Path’ also called the path of the ‘Red Dragon’. One of the famous books about this subject that made it from underground to more commonly know Path is by the work of Roger Caro (—the Grandmaster of the French Rosicrucian Order F.A.R.+C.) , The complete Great Work Photographed. Its free on the internet but there is also a very nice hard copy of this book available from Lapis publications. For many of us those pictures shown about the process triggers curiosity about this Path and how to practice it. Also ‘The Via Cinnabaris’ is very useful but also not accurate for obvious reasons. Like many other publications about this Path its not complete and there is information circulating from the FAR+C. And all this information is like a jigsaw puzzle to connect al the pieces to get the information what is needed. Some say this path is a dead end others claim that it is a very potent Path but also very dangerous. I’m just in the process of studying and experimenting with parts of this Path to see how things are related and to tune in into the current of this path. Since I’m just a beginner on this Path and since I have to experiment to see how to connect the dots I cannot show much about the process. 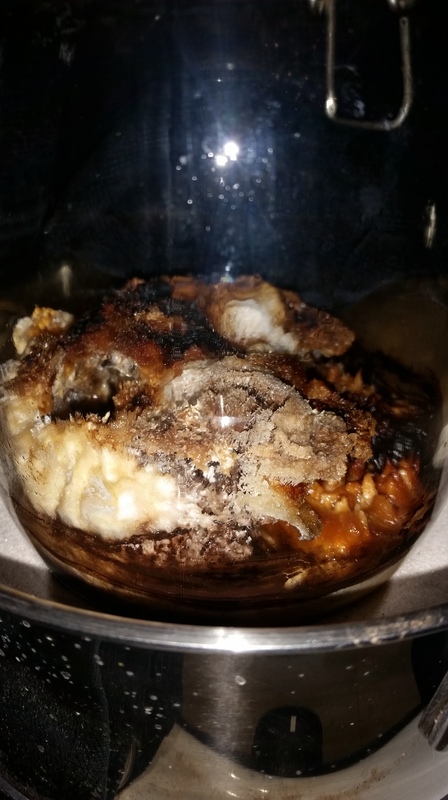 Obviously one of the basic ingredients is Cinnabar. 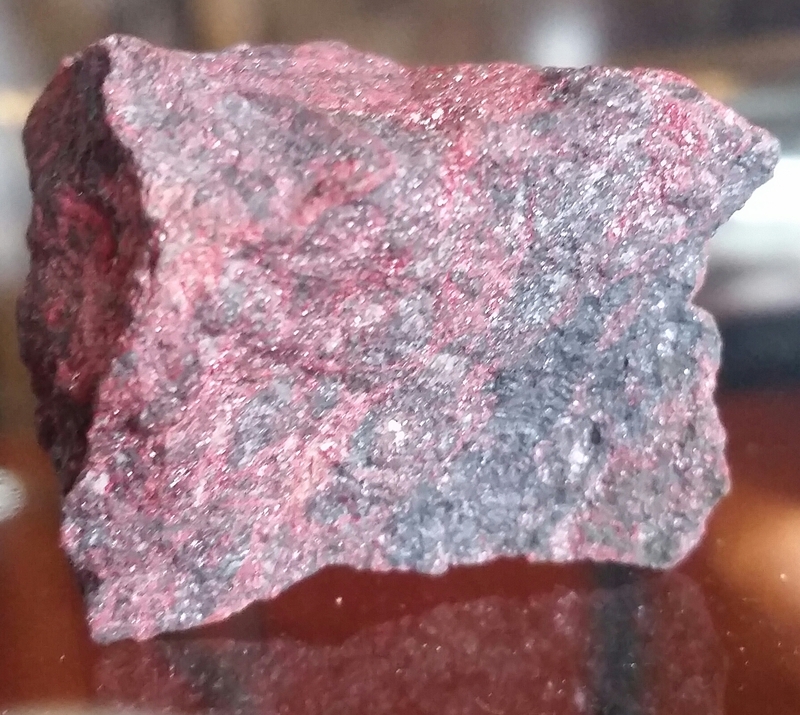 Some say the best Cinnabar to use is from Spain. I have mine from Brazil bought on Ebay. Also the whole process of making the Salts is an art in its own. This is what I’m working on at the moment. This is what is written by Roger Caro in the introduction. We will surprise no one by saying that a great number of seekers have asked us for the photographs which should illustrate the Siphra Di Tzeniutha. These 40 pictures, announced at the end of the Dictionary of Alchemical Philosophy by Kamala-Jnana, fascinate the adepts of the Great Art. Today, placed in chronological order, they are a true feast for the eyes of an Alchemist; a symphony of colors marking now the dry way of the Great Work, for what a job to regroup and methodically reorder this heap of scattered films, and give each of these a caption both valuable and audible to the Children of Light. Well, all that is no more than the past, a dark past, with neither glory or fame; a past made of sleepless nights, or of sleep troubled by a thought always in perpetual motion. This past lasted from 1961 to 1967 — six years of researches and readings — but in 9 months (thanks to our cards and notes) we had done all the spadework. Still, the light should illuminate the details only a great many months after, and progressively. Today everything is in order. A college of 20 adepts, under the chairmanship of the venerable Imperator of the FAR+C, has willingly given its unanimous consent to the appearance of the present work — certainly a modest one given its bulk and the number of its pages, but so great and weighty with information. May the Alchemical Temple of Ajunta see here our fraternal gratitude, for sincere seekers will find (thanks to this approbatur) a new source of information to master and in which to rejoice. What does it matter to us that a color plate (like those contained in the Dictionary) costs 75,000 old Francs altogether, and that there be 43 in the present work, since the hour is come to reveal that which is hidden. This sovereign R+C missionary of 83 years (younger and more active than many young people) has said to us, “Go forward, do not let anything stop you”. His wish is an old order. The Complete Great Work Photographed is off the presses. May heaven thus accord its graces to the future 250 possessors of these plates. That too is our dearest wish. This invocation is one of the most powerful I ever experienced. When properly done remarkable results will follow. “In the name of the Mighty and Terrible One, I proclaim that I have banished the shells unto their habitations. I invoke Tehuti, the Lord of Wisdom and of Utterance; the god that cometh forth from the veil. 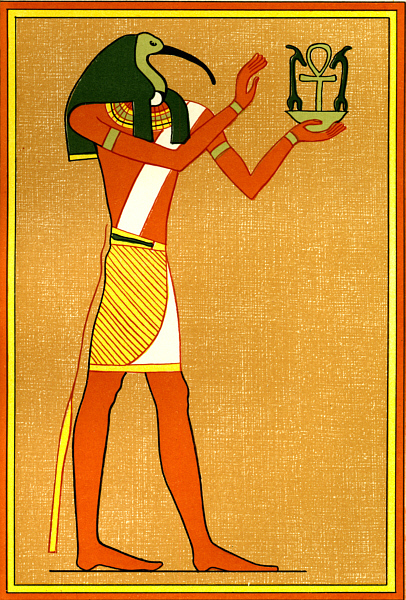 Oh thou, majesty of the godhead, wisdom-crowned Tehuti, Lord of the gates of the universe. Thee, thee I invoke. Oh thou of the ibis head. Thee, thee I invoke. Thou who wieldest the wand of double power. Thee, thee I invoke. Thou who bearest in thy left hand the ankh of light and life. Thee, thee I invoke. Thou whose head is as an emerald, and thy nemyss as the night sky blue. Thee, thee I invoke. Thou whose skin is a flaming orange as though it burned in a furnace. Thee, thee I invoke. Come thou forth I say, come thou forth and make every spirit of the firmament and of the ether, upon the earth and under the earth, on dry land and in the water, of whirling air and of rushing fire, and every spell and scourge of God the Vast One may be obedient unto me. Behold, I am yesterday, today, and the brother of tomorrow. I am born again and again. Mine is the unseen force whereof the gods are sprung, which is as life unto the dwellers in the Watchtowers of the Universe. I am the charioteer of the east; Lord of the past and the future. I see by my own inward light; Lord of resurrection who cometh forth from the dust, and my birth is from the house of death. Oh ye two Divine hawks upon your pinnacles who keep watch over the universe. Ye who company the Bier to the house of rest, who pilot the ship of Ra, ever advancing onwards the heights of heaven. Lord of the shrine which standeth in the center of the earth. Behold! He is me and I in him. Mine is the radiance wherein Ptah floateth over the firmament. I travel upon high. I tread upon the firmament of Nu. I raise a flashing flame with the lightening of mine eye. Ever rushing on in the splendor of the daily glorified Ra, giving my life to the dwellers of earth. If I say come up upon the mountain, the celestial waters shall flow at my command. For I am Ra incarnate, Kephra created in the flesh. I am the idolar of my father Tmu, Lord of the city of the sun. The god who commands is in my mouth. The god of wisdom is in my heart. My tongue is the sanctuary of truth and a god sitteth upon my lips. My word is accomplished every day, and the desire of my heart realizes itself as that of Ptah when he created his works. I am eternal, therefore all things are as my designs. Therefore do thou come forth unto me from thine abode in the silence, unutterable wisdom, all light or power. 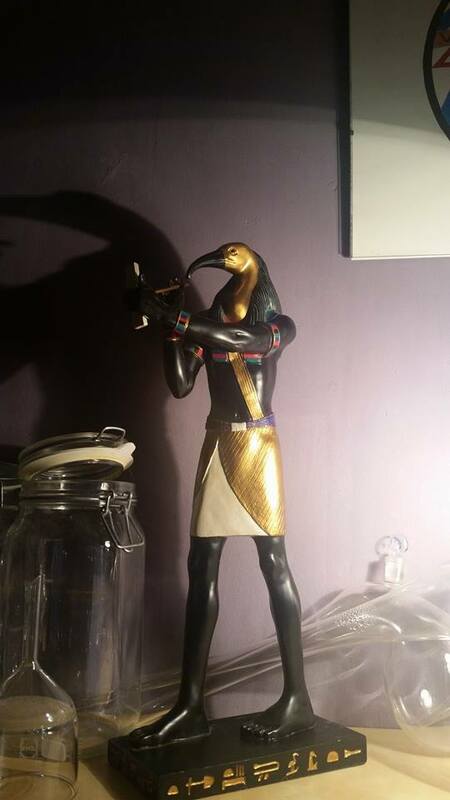 Thoth-Hermes, by whatever name I call thee thou art still nameless to eternity. Come thou forth I say, and aid and guard me in this work of art. Thou star of the east that didst conduct the magi. Thou art the same all present in heaven and in hell. Thou that vibratest between the light and the darkness, rising, descending, changing ever, yet ever the same. The sun is thy father; thy mother the moon. The wind hath borne thee in it’s bosom and earth hath ever nourished the changeless god head of thy youth. Process of transformation of the lead acetate. You see that the forces of nature are at work. There are moments it looks beautiful like when the first crystals were formed then it turnend dark and rose up. 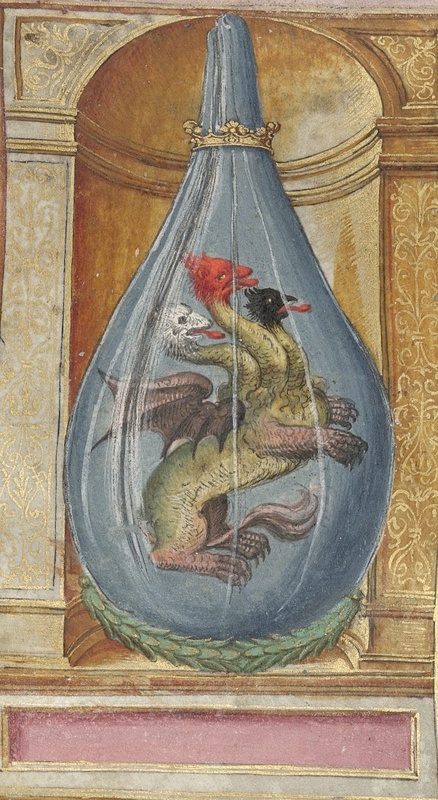 Now you see that it rise up again in three different colors, like the three headed dragon see picture below. The white, red and black. At the end it should be red after a long period. This acetate is transforming from chemical to alchemical. We make it philosophical so to speak. Afterwards when its ready I distill this acetate to produce the philosophical wine so to speak. A very special solvent.